Blank horizontal ribbons are a great option when you want to add your own titles at your event. Choose the fastener; tape on the front or back, pins, or not fastener at all. Custom sizes are available; contact customer service for more information. MINIMUM ORDER: 25 ribbons, colors may be mixed. SET-UP FEE: $5.00 for each ribbon color. PRODUCTION: Production times are based on the quantity and complexity of your order. Less than 10 ribbon colors and less than 2500 ribbons require 3 business days for production. Production will begin after approval of your proof. ORDERING INSTRUCTIONS: Choose a color for each set of ribbons, then enter the needed quantity. Add additional ribbons as necessary. Multiple colors can be combined to meet the 25 minimum requirement. 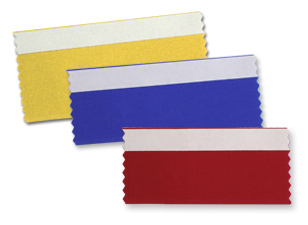 Satin acetate ribbon will be custom cut in your selected colors and sizes. Each ribbon has pinked edges on both short sides to prevent fraying. Custom sizes are available; contact customer service to order. SET-UP FEE: $5.00 for each ribbon color ordered.